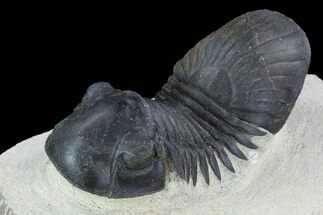 This is an EXTREMELY RARE lichid trilobite from Morocco, Acanthopyge. 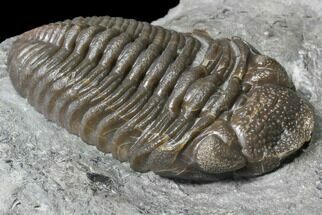 Real specimens are nearly impossible to acquire because not only are they rare, but they tend to be found disarticulated and the original locality was collected out years ago. This specimen is 2.75" long, has great shell preservation, and is covered in tiny pustules. Both of the genal spines were moved back into place during preparation. 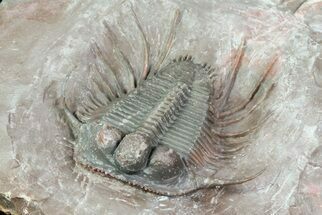 The trilobite had molted as is the case with nearly all Acanthopyge specimens, with the genal spines slightly separated from the head. 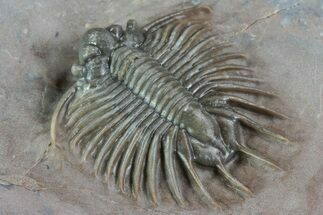 Otherwise there is no restoration on this specimen. 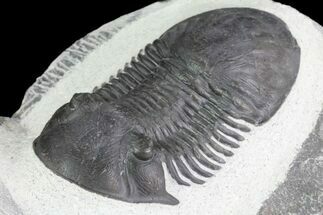 Beware: Due to the rarity/value of the trilobite, it's collectability and the fact it doesn't have free standing spines (making it easier to cast) this one of the most frequently faked trilobites out there. I've seen hundreds of fake specimens. 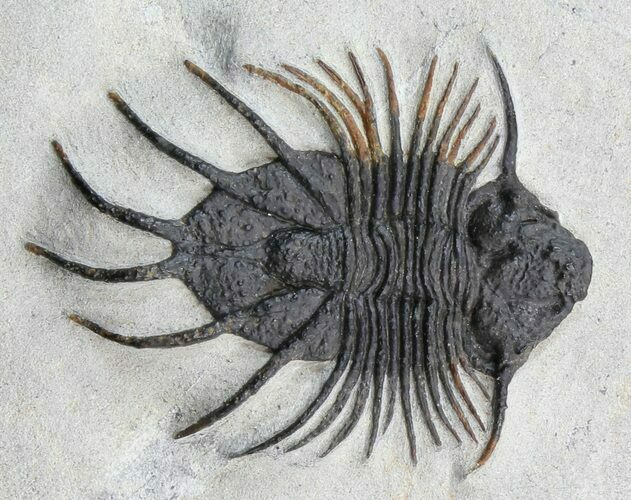 In fact this is the first real example I've seen for sale in years that wasn't a composite of multiple individual trilobites. The original locality for Acanthopyge was collected out many years ago, and there has only been a handful of complete specimens found at a new "secret" locality discovered in the past few years. This is only the second one I've been able to acquire in the past two years.